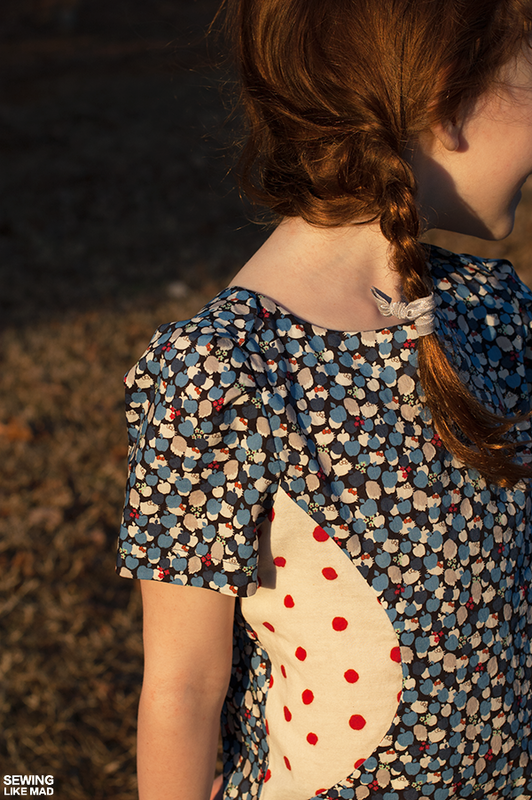 Sewing Like Mad: The Sunki Dress by Figgy's. 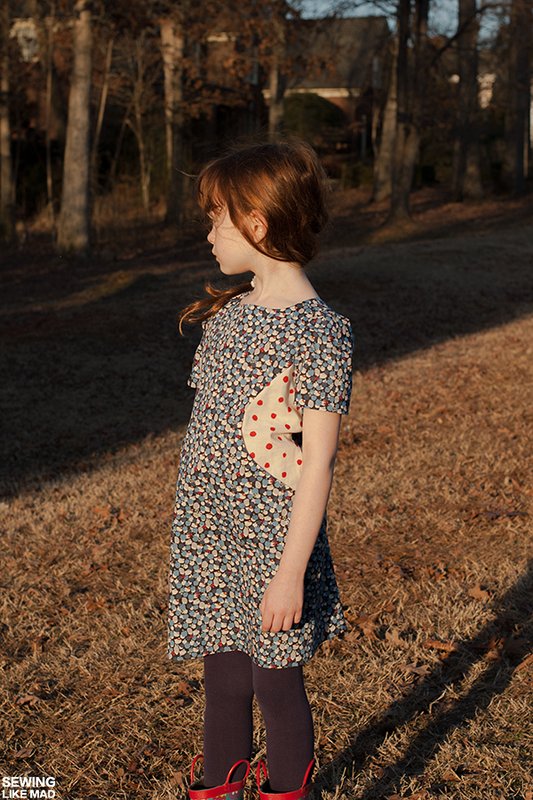 The Sunki Dress by Figgy's. 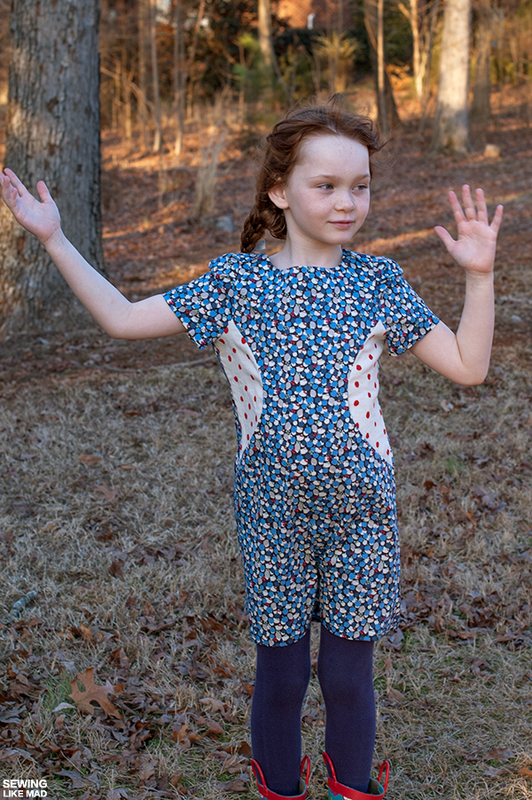 I have always looooved the style of Figgy's patterns but I have never sewn any...until now ta-da. 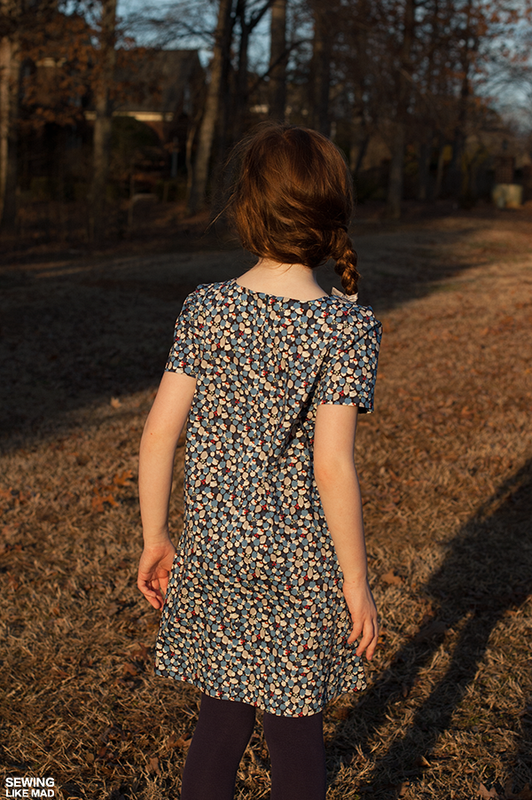 I'm using the Sunki Dress pattern for a super secret project but first I needed to sew the original and since I love the result (and the process) so much I figured I would show you too. I have heard some times that Figgy's patterns runs a bit wide and a bit short...which I guess it not the end of the world if you just know it. When looking at W's measurements and the pattern's measurements I decided to make W who turned 7 years old in January a size 6/7 and with a length from the size 8/9 pattern. The width is perfect for her but I might add a bit for length for the next one. Because there will be a next one....actually there will be many next ones. I absolutely LOVE this pattern. The fit is somehow effortless. I love the way those two flaps overlap at the shoulders - a perfect and elegant detail. 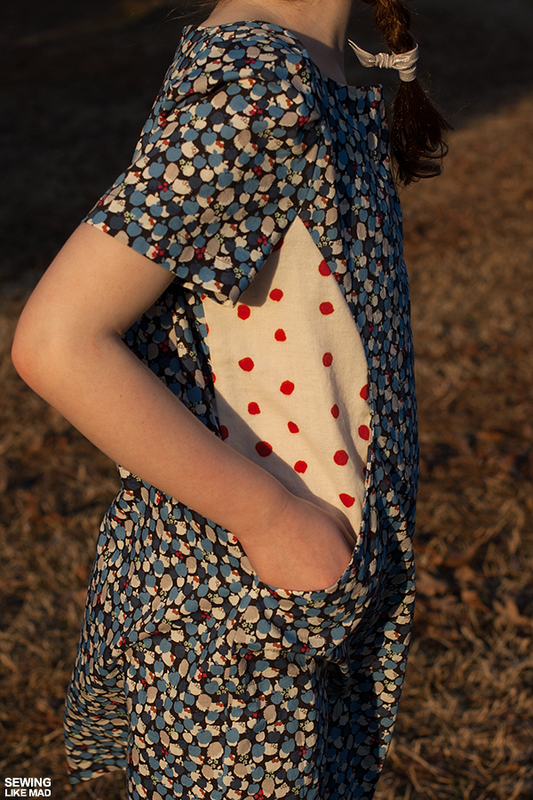 And I love how the pocket is ingeniously build into the curved seam at the front. And I love how those pleats at the sleeve are drafted with a perfect understated puff sleeve as a result. I have every notch I need (and no unnecessary ones) and this is a seriously pleasant pattern to sew. You basically just want to keep on going. It has an invisible zipper at the back...and no you can't see it, ha. Here is a close up of the 'secret' pocket. It's not deep enough - this is how far her hand can go down - but that is a very easy fix too for the next ones. Ha, it was a windy day. This is the best photo I got of the dress full on frontal. The fabrics are a very subtle Hello Kitty for Liberty and this gooorgeous cream double gauze with red dots from.....ehhhh, I would say either Miss Matatabi or Imagine Gnats.....but I have not been able to find it in either of their shops so I'm assuming it is sold out. I only have 1/2 yard and I wish I had like 10. I was kind of surprised when I realized it matched the Hello Kitty fabric - I never really imagined those two together. Get you Sunki Dress pattern HERE. It also comes in a teen/tween size version. I've always been curious about Figgys patterns too. Thanks for such a thorough review. It looks perfect! I made this pattern for my granddaughter two years ago. You are right - the shoulder/sleeve treatment is very clever and unusual. I found that it ran somewhat smaller than I expected, so she wasn't able to wear it very long. I also made the leggings that Figgy's carries to wear with it - it was a very nice outfit. The pattern is great for innovative fabric/print choices. I like your iteration. 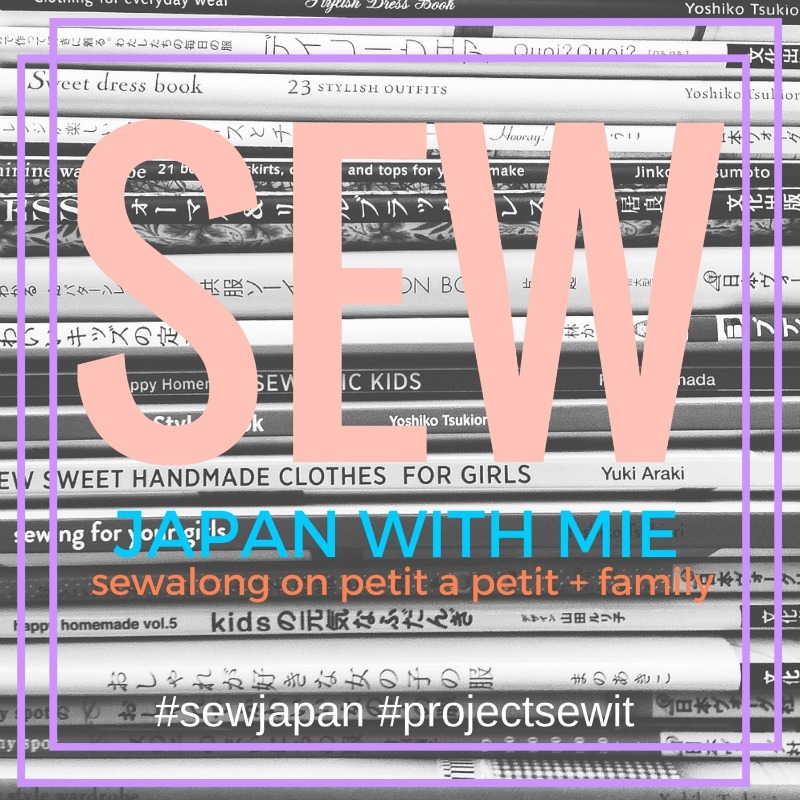 It's an inspiration to sew another one (much larger!) for spring/summer. Thanks for posting. What a surprise that hello kitty fabric, I had to look closer when I read it! I love it! Where did you buy it? I bought it on sale on fabric.com a loooong time ago. I don't think they still have it. I don't think it is part of Liberty's permanent collection :-) But maybe you can find it on Ebay or something? Love the fabric combo Mie. The dress looks fun and sophisticated at the same time. This looks lovely, using a contrast for those side section really lifts this dress. Can't wait to see what you do next with this pattern. Love it! The fabrics really work great together! Can't wait to try this pattern too. so beautiful! Love your fabric choices together and glad you had such a pleasant sewing experience. 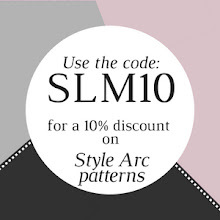 I agree that this is such a great pattern - effortless style! Love you fabric combination, so cute. And i really need to make E a Sunki, I just love the style and you've def reminded me how cool it was. Love it all! Awesome photos too. This is gorgeous Mie!. I always has been intrigued with the Sunki dress pattern. You made a really pretty one, the mix in the prints is fantastic, not say your model and the tint of your pictures, lovely! oh and that Hello kitty Liberty fabric is very subtle, i didn't noted the Hello Kitty faces until you mentioned. Ahh! This is amazing. Those fabrics together are just gorgeous! Thanks for all the fitting tips! Now that is one invisible invisible zipper! You nailed it! The Twisted Trousers and Tank Top.